"Despite promises that the law will lower costs, [Obamacare] will in fact cause the premiums of many Americans to spike substantially," a new report released by the U.S. House of Representatives Committee on Energy and Commerce concluded. "The broken promises are numerous, and the data reveals that many Americans, from recent college graduates to older adults, will not be able to afford the law's higher costs." The report, based on responses from 17 insurance companies to a letter from lawmakers asking them to estimate the effects Obamacare would have on premiums, found that individuals in about 90% of all states would likely face "significant premium increases." Further, consumers purchasing health insurance in the individual market may face premium increases of nearly 100% on average, with potential highs eclipsing 400%, the study found. Insurers warn that premiums will increase because Obamacare requires increased healthcare services and benefits while at the same time limiting insurers' ability to charge consumers based on age or health status. Increased minimum coverage requirements for those already insured will lift premiums, and insuring 30 million currently uninsured Americans, many of whom are unhealthy, will only compound those effects. 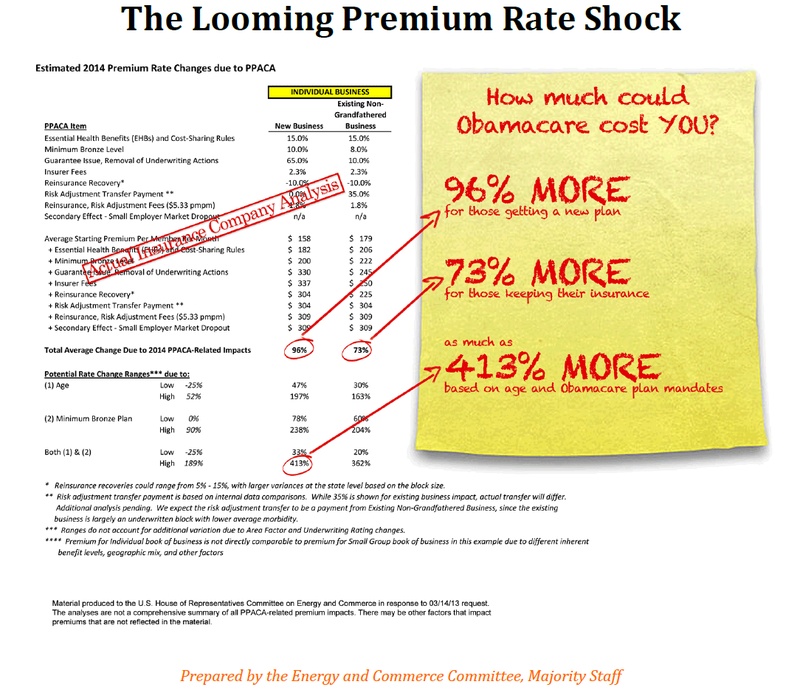 Using data provided by one of the leading insurers, the following graphic – prepared by the Energy and Commerce Committee – highlights just how badly Obamacare could hurt individuals, even ones who already have insurance. In addition, small businesses in almost every state will see premiums rise. On average, increases will be 10%, but in some states premiums will increase 50%, with the potential for 100% surges for some small businesses. For more on surviving Obamacare, check out this exclusive interview we conducted with author Betsy McCaughey, Ph.D., the author of "Beating Obamacare: Your Handbook for the New Healthcare Law." She answered our biggest questions about the "real" Obamacare facts – and could answer yours, too – right here. What a total crock. What are we paying 500 or so degreed lawyers to do all day? Fix the G D thing so we all get the same benefits they do! It's basic liberal math. You take an average group of citizens who are in average health and pay average premiums and then force that group to pay for people who are at risk, have terminal illness and who could not otherwise pay for anything-YOUR PREMIUMS GO UP. It's the great health subsidy. Instead of the government paying for it, the responsible taxpayer is paying for it. It's just too bad the average independent voter isn't smart enough to realize this. Agreed. As a self employed person, I have for over 25 years done the right thing and bought my health care to protect my family and myself. Since the announcement of Obamacare, I am being forced to substantially reduce or loose my coverage all together. In the past 3 years, my premiums have increased 64%. I have no major health issues or conditions. The new ploy is wholesale cancellation of your current "Plan". Which is being "replaced" with a more expensive and lower coverage one. To keep "almost" what i had, will only cost me an additional $300 per MONTH. Thank goodness we have those like Nancy Pelosi, Harry Reid and President Obama that KNOW what the American people "Want and Need". Something tells me the healthcare plans in Washington for Pelosi and Reid are not changing all that much. I agree, it is the average voter that is not smart enough to vote out those who's only vision is what they can force us to pay for.